The United States Football League’s most prolific offense faced the top-ranked defense in a Saturday night game on April 21, 1984. The Houston Gamblers, one of six expansion teams for the USFL’s second season, utilized the “run-and-shoot” offense to good effect, rolling up yardage and averaging 32 points per contest. 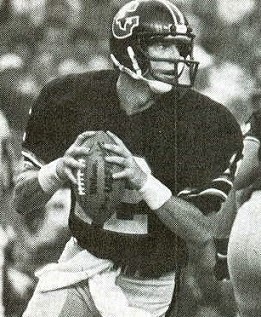 Rookie QB Jim Kelly (pictured above) proved highly effective operating in the quick-striking offense and WR Richard Johnson was the most productive of a good pass receiving corps and came into the game leading the USFL in pass receptions. The team could run the ball well, too, although RB Sam Harrell, the league’s top scorer and second-ranked rusher, was out with a broken foot. The Gamblers had a 5-3 record, which put them one behind the co-leaders in the Central Division. The Arizona Wranglers were coached by George Allen and, as was typical of his teams in the NFL, the roster was filled with veteran talent, especially on defense. The club that had been the Chicago Blitz in 1983, before an offseason exchange of franchises moved them to the Phoenix area, had a conservative offense that was directed by capable 16-year veteran QB Greg Landry. The defense averaged just 14.25 points given up per game, but the team still struggled with consistency and had difficulty winning games. The Wranglers were 4-4 and three games behind the Denver Gold in the Pacific Division. As a side note, Head Coach Jack Pardee of the Gamblers had played under Allen with the NFL Rams, thus adding a pupil-vs.-teacher element to the matchup with Arizona. There were 23,117 fans in attendance for the Easter weekend game at the Astrodome. The Gamblers had the first possession and drove into Arizona territory with the help of big completions to Richard Johnson and WR Greg Moser, who made a spectacular leaping catch. Toni Fritsch kicked a 39-yard field goal for the early lead. Houston CB Mike Mitchell intercepted a pass by Greg Landry on the next series, but on the next play DE John Lee grabbed a Kelly screen pass out of the air. A completion to RB Tim Spencer got the ball into scoring territory and, while the Houston defense held, Frank Corral booted a field goal from 23 yards. The score remained 3-3 after one period of play, but the Gamblers were at the Arizona 20 as the second quarter started. Kelly passed to RB Todd Fowler, the fill-in for the injured Sam Harrell, to get the ball to the five and, two plays later, Kelly ran into the end zone for a two-yard touchdown. Fritsch added the extra point and the home team held a 10-3 lead. Houston got the ball back when the Wranglers punted from deep in their own territory and the Gamblers struck quickly with a Kelly completion to a wide-open Johnson for a 53-yard TD. Fritsch converted. Down by two touchdowns, Arizona drove into Houston territory but came up short on a fourth down play at the 18. The Gamblers capitalized with another long pass play, this time with Kelly throwing to WR Ricky Sanders for a 77-yard touchdown. With Fritsch’s PAT, the home team led by a commanding 24-3 margin. The Wranglers fought back on a possession that concluded with a 25-yard TD carry by Spencer. Corral’s extra point made it 24-10, and that remained the score at halftime. Arizona drove methodically to start the third quarter, going 70 yards in 11 plays and ending up with a Landry pass to WR Trumaine Johnson, who caught the ball between two defenders for a 13-yard touchdown. Corral again added the point after and it was a seven-point game. The offensive show slowed with the teams exchanging punts after short possessions before the Gamblers advanced into Arizona territory, but after reaching the 16 they fumbled the ball away on a third down play. The Wranglers took full advantage on a series highlighted by completions to WR Lenny Willis and Tim Spencer that concluded with Spencer running for a two-yard TD. Corral’s kick tied the game at 24-24 with thirty seconds remaining in the period. With the once-large lead gone and the game now in the fourth quarter, the Gamblers drove 80 yards in six plays to score a touchdown on a 17-yard Kelly throw to Johnson, who was left uncovered in the end zone. Fritsch kicked the extra point and the home team was back in the lead by seven points. Arizona reached the Houston 20 in response, but after being backed up by a penalty and a sack, a 50-yard field goal attempt by Corral was blocked and returned 58 yards for a TD by DE Pete Catan. Fritsch hooked the try for the extra point, but it didn’t matter. With ten minutes remaining, the Gamblers were back in control. The Wranglers had a chance to get back into the game when Kelly fumbled in his own territory, giving the visitors the ball. But after getting one first down, a fourth-and-five pass play came up short and the Gamblers regained possession. It was the last gasp for Arizona and Houston won by a final score of 37-24. The total yards were nearly even, with the Gamblers holding a one-yard edge (401 to 400) while the Wranglers accumulated more first downs (26 to 17) and held onto the ball longer (34:37 to 25:23). Arizona had the better offensive balance, with 266 passing and 134 rushing yards, to 61 yards on the ground and 340 through the air for Houston. The Gamblers also turned the ball over three times, to one turnover by the Wranglers, and Houston was hurt by 14 penalties, to eight flags thrown on Arizona. But big, quick-striking plays put points on the board for the Gamblers, as well as the decisive blocked field goal return. Jim Kelly completed 17 of 23 passes for 363 yards and three touchdowns, with one interception. Richard Johnson had 6 catches for 143 yards and two of the TDs and Ricky Sanders gained 86 yards on just two receptions thanks to the one long touchdown. Todd Fowler, in place of the injured Sam Harrell, was an effective receiver out of the backfield with 6 catches for 70 yards, and he rushed for 51 yards on 11 attempts. For the Wranglers, Greg Landry was successful on 27 of 41 throws for 278 yards and a TD while being picked off once. Tim Spencer ran for 110 yards on 16 carries and also gained 52 yards on five catches. RB Doug Dennison led the club with 6 pass receptions, for 35 yards, while Lenny Willis contributed 69 yards on five catches. Houston went on to top the Central Division with a 13-5 record. The Wranglers, seemingly in danger of falling out of contention after the loss in Houston, won six of their remaining nine games, including the last four straight, to place second in the Pacific Division at 10-8, good enough to grab a Wild Card playoff spot. Arizona got revenge on the Gamblers with a 17-16 First Round playoff upset and made it to the USFL Championship game, falling to the Philadelphia Stars. Jim Kelly went on to accumulate 5219 passing yards while throwing for 44 touchdowns and averaging 8.9 yards per attempt. 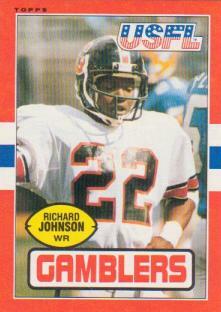 Richard Johnson remained first among USFL pass receivers with 115 catches, for 1455 yards and 15 TDs, while Ricky Sanders placed second with 101, gaining 1378 yards and scoring 11 touchdowns.